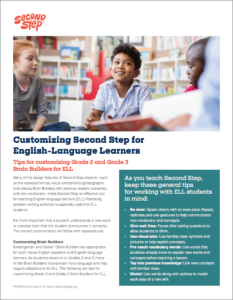 Many of the design features of Second Step lessons—such as the repeated format, visual components (photographs and videos), Brain Builders, skill practice, realistic scenarios, and new vocabulary—make Second Step an effective tool for teaching English-language learners (ELL). Practicing problem-solving activities is especially useful for ELL students. Be clear: Speak clearly with an even pace. Repeat, rephrase and use gestures to help communicate new vocabulary and concepts. Give wait time: Pause after asking questions to allow students to think. Use visual aids: Use familiar, clear symbols and pictures to help explain concepts. Pre-teach vocabulary words: Use words that students already know to explain new words and concepts before teaching a lesson. Tap into previous knowledge: Link new concepts with familiar ones. Model: Use words along with actions to model each step of a new skill. It’s more important that a student understands a new word or concept than that the student pronounces it correctly. The correct pronunciation will follow with repeated use. Download and print this PDF for your lesson book. Kindergarten and Grade 1 Brain Builders are appropriate for both native English speakers and English-language learners. 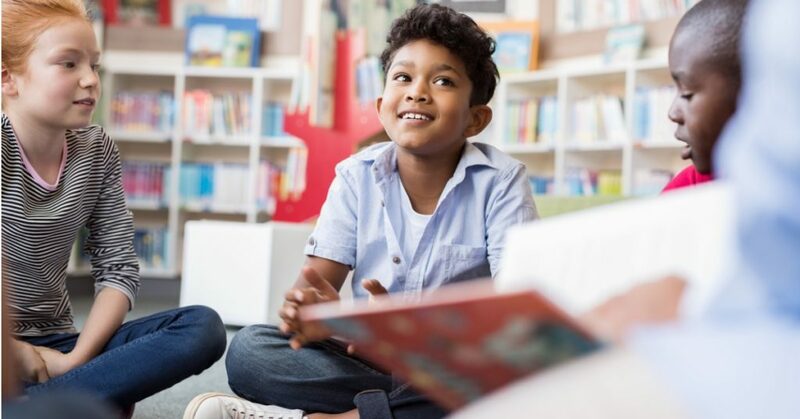 As students advance to Grades 2 and 3, many of the Brain Builders incorporate more language and may require adaptations for ELL. The following are tips for customizing Grade 2 and Grade 3 Brain Builders for ELL. Pair English-language learners for success and have them focus on remembering one menu item. Read three words out loud, such as focus, attention, and listen. Read the words again. When you leave out one word, students should sit. When you leave out no words, students should stay standing. Show three or more images. You could use flashcards. Show the images again. When you leave out one image, students should sit. When you leave out no images, students should stay standing. Shorten the word lists to three words. Show students the series of images twice. Have students hold up one finger when they’ve seen an image twice. Have them stand and point to their eyes when they’ve seen three matches. Show a Feelings Card and name the feeling. Display a sample bar graph with matching movements for always, sometimes, and never. Use only one word, and count to twenty. Show a card with an image and a word when students need to say it. Role-play the scenario with students. Role-play an “if” statement, then have student pairs role-play the “then” statement. Before playing, go over the class feelings list. Have students think of five feelings to say during the game. As students name feelings during the game, hold up the matching Feelings Card. Before playing, review the class feelings list. Have students think of feelings to say during the game. Also, review students’ stop signals and post a few examples in a place visible to students. Read three blaming words/phrases out loud, such as always, never, and because of you. Read them again. When you leave out one word/phrase, students should sit. When you leave out no words/phrases, students should stay standing. Before playing, write blaming words/phrases on the board and go over them. You could also make vocabulary cards for the Second Step keywords listed in the lessons. Point to blaming words/phrases as you say them. Give a verbal direction, then model it for students before they do it with their partners. Pair English-language learners for success and have them focus on remembering one thing their partners said. Model the directions after giving each one. Read them again. When you leave out two words, students should sit down. When you leave out one word, students should reach up. When you leave out no words, students should stay standing. Show the images again. When you leave out one, students should sit. When you leave out two, students should reach up. When you leave out none, students should stay standing. Lesson 7: Switch It Up! Before playing, go over the class feelings list. Make sure it’s visible during the game. Model the actions for showing same and different preferences. Pair English-language learners for success and have them focus on remembering one thing their partner said. Simplify Talk Topics: name three colors, animals, months, sports, etc. Pair English-language learners with students who can support and encourage their developing conversation skills. Pair English-language learners with students who can support and encourage their developing English-language skills. Have partners work together to think of three rhymes for a word. Have them memorize the words. Call on a few pairs at random to report their rhymes. Before playing, review the class feelings list. Have students think of feelings to say during the game. Also review students’ stop signals and post a few examples somewhere visible to students. Pair English-language learners with students who can support and encourage their developing English language skills. Show students images of the anger expressions before they create their movement sequence. Allow English-language learners more time to think of possible answers. If they think of an answer in their native language, help them use the dictionary to find the equivalent in English. Read the words again. When you leave out one word/phrase, students should sit. When you leave out no words/phrases, students should stay standing. Before playing, write blaming words/phrases on the board and review You could also make vocabulary cards for the Second Step keywords listed in the lessons. Teach students one action to use to show they’re ready to answer. Have a student point to the antonym card (see below). Review, then display antonyms cards with images.